Climate Common Sense: Obama's Numbers in the Toilet- Global Warming Bill should Join Them! Obama's Numbers in the Toilet- Global Warming Bill should Join Them! 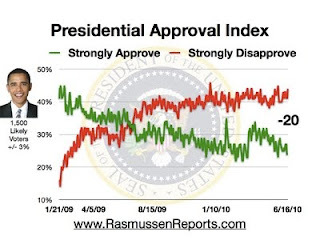 Global Warming skeptics around the world will be heartened by the latest Rasmussen Report which has President Obama with a Presidential Approval Index of -20%. This coupled with a generic congressional poll result showing the GOP on 46% compared with the Democrat's 36% , will severely limit his options in forcing through a global warming bill. Republican candidates now hold a 10-point lead over Democrats on the Generic Congressional Ballot for the week ending Sunday, June 13. That ties the GOP's largest ever lead, first reached in April, since it first edged ahead of the Democrats a year ago. 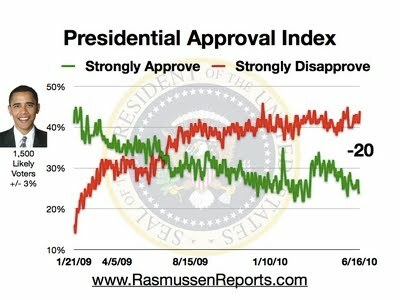 A new Rasmussen Reports national telephone survey finds that 46% of Likely U.S. Voters would vote for their district's Republican congressional candidate, while 36% would opt for his or her Democratic opponent. A week ago, Republicans led 44% to 36%. The rest of the world will not do much until the US commits itself which may be a long way off.. Obama may well find himself with a hostile legislature at the end of the year and will need to use his VETO stamp to prevent the Republicans cleaning up the mess he has made of health and the US deficit blowout.